The year 2019 is going to introduce many 5G smartphones from different brands. This is after the much popular of 4G feature devices with different pattern in different prices at different time. You would have observed the competition and game changing often from new to old OEM. There were huge shout about 5G smart devices since few months in different Expo viz. CES, MWC and on. Samsung recently announced that it will start to sell first 5G smartphone, Galaxy S10 5G on April 5, 2019 in Korea. So, the next in the news is all about LG brand. Yes, LG V50 ThinQ 5G smartphone will be in the market after April 19, 2019. The official confirmation detail to be seen soon. In general, 5G smartphone would come with most features packed one. The phone would cover many additional features compare to 4G cell phones. The Telecom operator in local in different region may suit 5G speed for it sooner or later, like it happened to 4G phones. 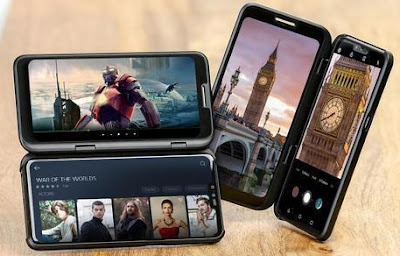 If you are looking for LG V50 ThinQ 5G phone's key features, technical specification, price, unboxing, first impression, hands-on, comparison and review etc. then you could find few of them over here once the brand is officially launches it on said date. Stay tuned for more updates on LG 5G smartphone.